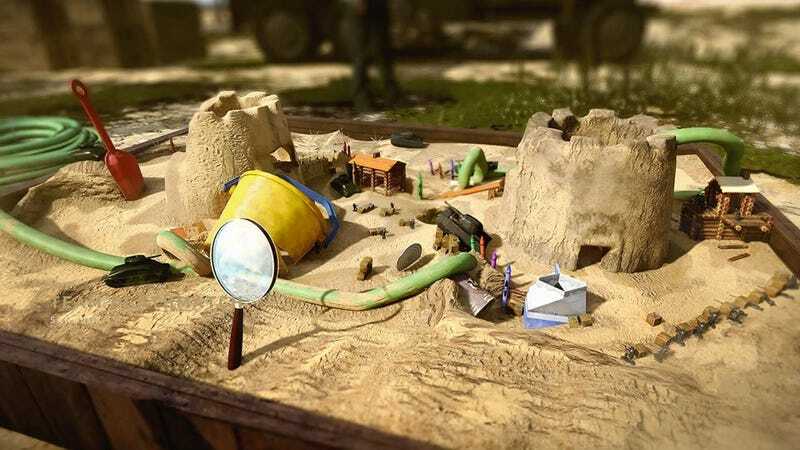 Heard of “sandbox games?” Well, now it’s literal: You can play as tiny, plastic soldiers in a sandbox as part of Call of Duty: WWII’s Days of Summer event. The seasonal fun also spans across Black Ops III, Modern Warfare, and Infinite Warfare, but this particular map is exclusive to WWII, and is one of the better ones. Sandbox arrived with the Days of Summer event on July 31 as free DLC for PlayStation 4. The new map does hold the standard 30 days’ exclusivity for PlayStation users, awkwardly forcing Xbox One and PC players to wait until summer is coming to an end before they get a chance to play it. Sledgehammer Games has really put great thought into their own larger-than-life Sandbox experience, which lets you enjoy some sun and sand as little plastic army men in a sandbox filled with toys. Your plastic soldier will use a baseball, sand pail, crayons, ersatz Lincoln Logs and more as cover for a fight that takes place inside an actual sandbox within the WWII HQ space. The map’s background is the lower portion of the HQ, and located not far from the scorestreak training tower. The HQ’s Quartermaster, Captain Butcher, sits just outside the map with a magnifying glass that he uses to periodically burn a deadly streak of fire down the middle of the map. This isn’t a controllable scorestreak—it’s just another way to die in the sandbox. As an added touch, you can even find the sandbox in the actual HQ, to get a sense of what it looks like from human size. A lot of Call of Duty’s recent fun stems from the modes that don’t take the game too seriously. While I can appreciate the initial attempt to make WWII historically accurate, I really enjoy the silly modes: Call of Duty’s hide-n-seek with Prop Hunt, zombies in multiplayer, hunting trolling leprechauns, and now the whole Honey, I Shrunk The Kids vibe in a sandbox. Days of Summer also brings new challenges and gear, including three new guns and a watermelon camo. The HQ social hub has even been dumped with sand and lots of umbrellas to bring that warm summer vibe. A 6 versus 6 aerial dogfighting mode is available for a limited time, which is great for players who want more of the same air combat featured on the “Operation Husky” War map from The War Machine DLC. I’m not sure how pesky sprites fit into the seasonal theme, but the Leprechaun Hunt has also returned. The event will last until August 28, so grab some sunscreen and toss those beach balls in the HQ while you can.